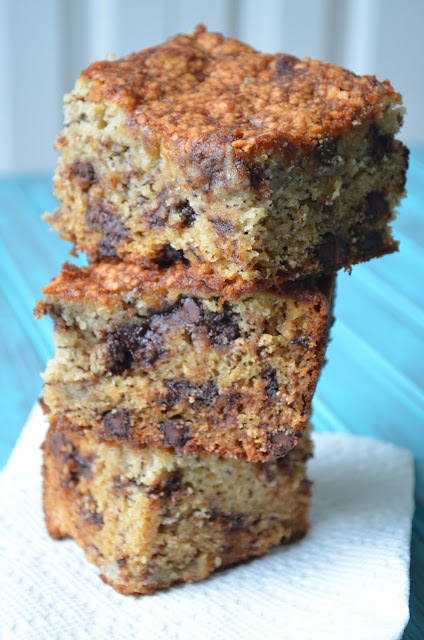 Banana Chocolate Chip Cake is my sister-in-law's recipe. From the first time she made it, my family was hooked. 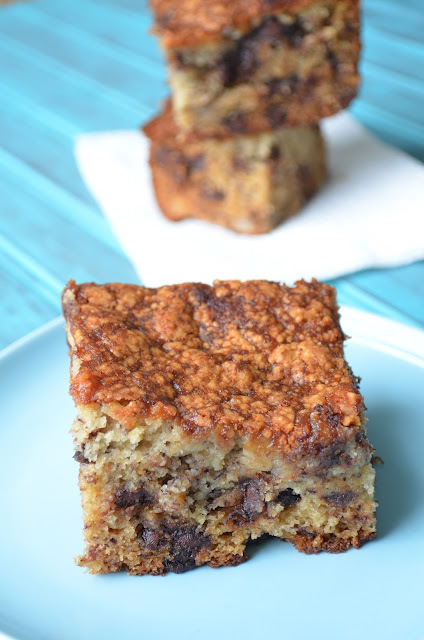 The combination of bananas and chocolate is pure bliss, plus the cake comes out super moist from the use of mashed bananas. This is often requested for birthdays or holiday gatherings and it never disappoints. I made this one evening when I was bored (don't you bake when you're bored, too?) and realized that a 9x13" cake was way too much for Chris and me to devour on our own. He took half to work, and he said it was gone in minutes. At the request of his coworkers, he took the remainder the next day and again, it was gobbled up right away. I highly recommend this for a get-together or for a way to impress company. It's easy to make and is great both at room temperature or chilled. Enjoy! Preheat oven to 350 degrees F (325 degrees F if using Pyrex). In a large bowl, mix sugar and vegetable oil. Add in eggs, sour cream, bananas and vanilla. Stir to combine. Slowly add in flour mixture. Stir until just combined. Fold in chocolate chips. Bake in a 9x13" pan for 30 minutes (50 minutes if using Pyrex), or until a toothpick comes out clean. Once cooled, cut into squares and serve. Store in an airtight container.